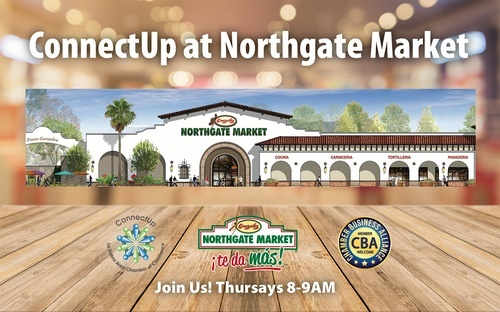 Thursday mornings we attend the Chamber's ConnectUp at Northgate Market. A no pressure opportunity to meet members of the community that include: businesses, city staff, elected officials, organizations and active residents. The focus is on building relationships first. As a member of a CBA participating Chamber, you are welcome to attend ConnectUp on the first Thursday of each month, only. You are welcome to pass out cards and will have an opportunity to participate when we do introductions. If you are interested in attending as an invited guest, please call (562) 697-1704. Free to members and invited guests. If you are interested in attending as an invited guest, please call (562) 697-1704.